Sometimes wonderful things come in small packages and so it is with the diminutive, yet breathtaking island of Sunset Beach. Only three miles in length, Sunset Beach is every inch a beautiful respite from the harried pace of the “outside” world. The southernmost island in North Carolina, Sunset Beach once had the only floating swing bridge across the salt marsh and Intracoastal Waterway, which was the only way to access the island, but today there is a new 32 million dollar highrise bridge to access the 3 miles of shoreline on Sunset Beach. Families love to come to this island to enjoy the cluster of pasted beach cottages nestled deeply behind the slope of dunes. Sunset Beach offers a breathtaking shoreline nicely juxtaposed against the excellent restaurants, interesting shops and championship golf and tennis which are all fully accessible right across the bridge. As appealing as its name, Sunset Beach, with its 3 mile beach, is attractive in its landscape and its relaxed nature. Sunset Beach is part of the South Brunswick Islands in Brunswick County, NC. 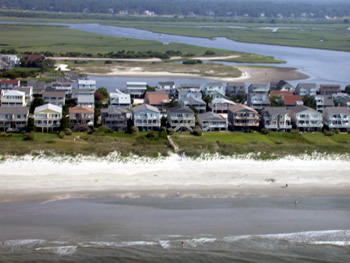 Ocean Isle Beach is directly to the North along with Holden Beach, Oak Island, Bald Head Island, and Southport. Little River, North Myrtle Beach, and Myrtle Beach are located to the North. Calabash, the seafood capital of the world is located 5 minutes from Sunset. A variety of real estate opportunities are available at Sunset Beach, North Carolina.